The rumors are true, there is a major redesign of Pivotal Tracker in the works, with a long list of new features. For those of you already using it as part of the private beta—thanks for all the feedback so far! Today, we’re excited to start a gradual rollout of the beta to everyone. With this redesign, we want to make using Tracker more of a delight, day in and day out. But most importantly, we’re aiming for Tracker to be a better collaboration platform for software development teams, and make it easier to stay organized and focused as your projects and companies grow. The beta is work in progress, but you’ll find a long list of new features available now, ready to make working with your projects easier. Multi-project workspaces allow you to see and work with multiple projects side-by-side, with cross-project search and My Work across your projects. Multiple story owners, editable comments, and in-app notifications make collaboration on larger projects much easier. Markdown in comments and descriptions should make for clearer, richer stories. You can now add rich text elements like code blocks, bullet points, numbered lists and emphasis. Finding the right stories is easier, with the much improved search syntax, and more usable saved searches. You also have more control over the interface, with the ability to reorder panels via drag and drop, and adjust panel width manually (hint: double-click panel headers to auto-resize). We’re rolling out the new Tracker UI gradually, starting today, and expect to have it available for everyone over the next few weeks. For now, the beta is opt-in, so look for the Switch to Beta button in the header when in your project. You can switch back to the original user interface at any time, via the dropdown menu under your username in the top right corner. 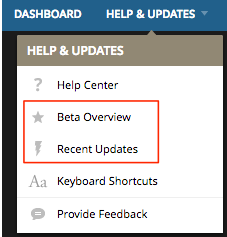 When you first jump in, you’ll see a Beta Overview panel, with a tour of all that’s new in the beta. Follow along as we roll out new features with the Recent Updates panel, both of these panels are accessible at any time via Help and Updates menu. Note: We’re redesigning a solution to improve on Tracker’s commit mode feature. Currently, commit mode is not supported in the beta, and projects with commit mode will be read only. If you’re using commit mode to manually plan your sprints, we’d love to hear from you so we can better understand your workflow. Also, for now, browser support is limited to recent versions of Chrome, Firefox, and Safari. We’re relying on your continued feedback to make Tracker really amazing. You can share your thoughts right from within the beta, via the feedback button in the navigation sidebar. And, if you’re not already, please follow us on Twitter for all the latest Tracker news!